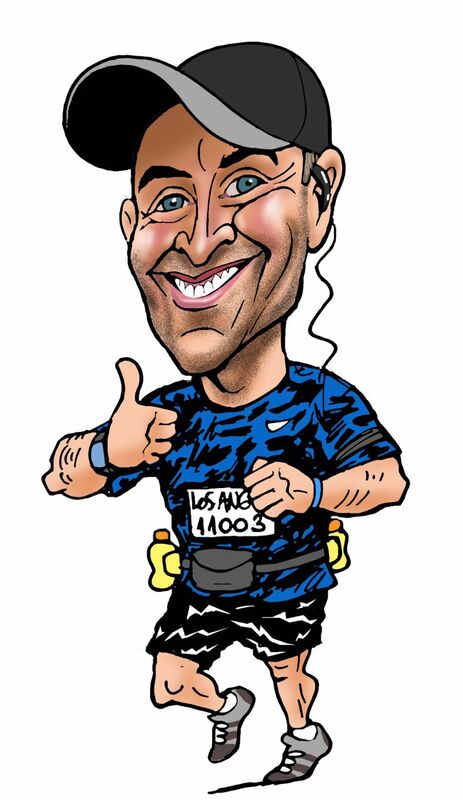 About a year ago, I first showed off the cartoon version of my running mugshot… remember this? Go to I<3torun.org and their “create” eBib page. Choose a character (or pick my cartoonized face if you so choose). Select a simple color background for your bib. Jot down a motivational/funny/cute saying. You could then e-mail your eBib or post it on a plethora of social media sites. Well, the eBib caught on and literally thousands of them have been created so far. And ilovetorun.org has decided to up their game. Hence the creation of eBibs 2.0. In fact ilovetorun.org has redone their entire website. 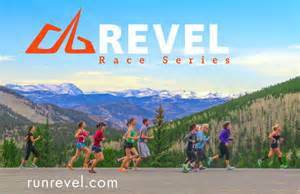 They’ve got really cool running-inspired men’s and women’s clothing, along with their monthly “100-mile challenge” belt buckles and medals. So check them out. And with over 300 personalized caricatures present, you can have quite a bit of fun. In fact, I decided to get a new caricature done myself, so here’s my latest “cartoonized” eBib! eBib 2.0 in the cartoon flesh! And now the part you’ve all been waiting for… the contest! How would like to get “cartoonized” yourself and win a free caricature (valued at $29.00). 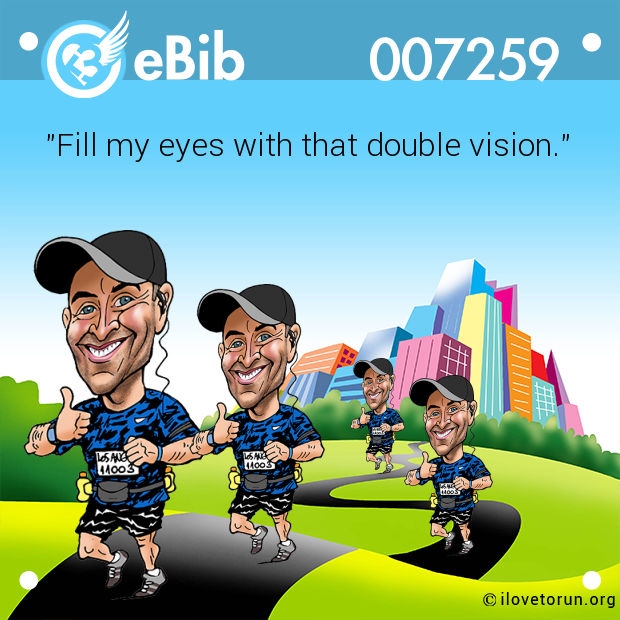 Well, the fine folks at I<3torun.org are going to give away (3) free caricatures… one for each of the three best eBibs created from Feb. 9th – Feb. 15th. 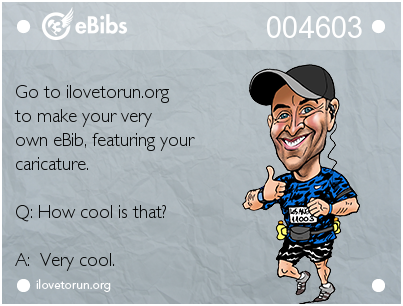 Go to I<3torun.org and create your finest eBibs (make as many as you’d like). It can be funny, motivational or whatever else you choose. Pick any background or caricature. Post the link in the comments section below (please include your name or some way to identify you). Or post the link on the Tripping The Kenyans Facebook page. Or even just post/e-mail me your unique eBIb Number (it’s in the upper right corner) along with your name. After that I’ll go through and pick the three that either make me cry, smile or shoot milk through my nose. I’ll post the winning eBibs on Tripping The Kenyans. That’s it. And feel free to share this blog post with any and all friends, family or running groups. Standard contest rules apply. All decisions will be made by Tripping The Kenyans and are final. Blah blah blah, “lawyer speak” and all that. If in doubt, go call Saul… tell ’em Heisenberg sent you. If you have any questions, please contact me. Have fun and get eBibbing! 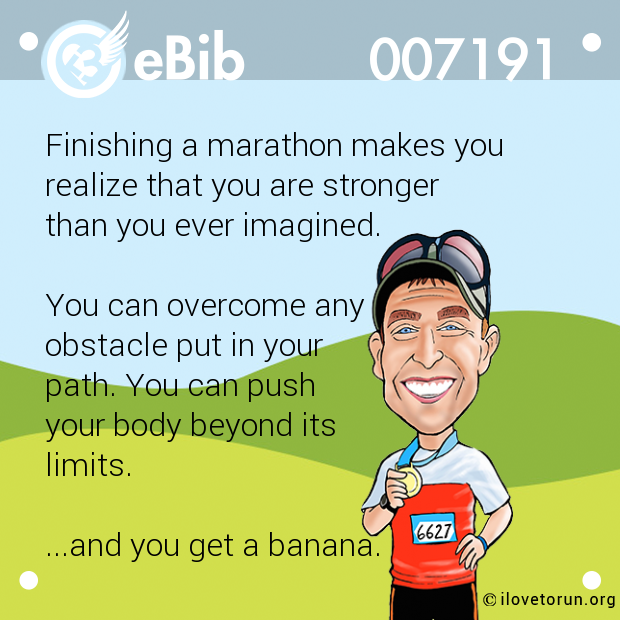 Posted on February 9, 2015, in Contest, General and tagged ilovetorun.org. Bookmark the permalink. 19 Comments. Okay, last one . . .
A link? Boy, you are getting technical on me. How about 007308 on eBibs… That’s mine commemorating my marathon at the beach this past weekend. Hey… I’m not seeing bib 7308 on the page. Try this, go to the page and then copy the big URL and paste it here so I can see it. Congrats on having one of the winning caricatures…. so choose a photo you want to use and then e-mail it to me at badger91@aol.com. Just seeing this response Scott. Sorry, we’ve been dealing with snow, ice and craziness with the winter storm that passed over us a few days ago. How cool! Will send a photo in a few minutes. Congrats on winning a caricature with your eBib. Find a photo you like and e-mail it to me at badger91@aol.com.